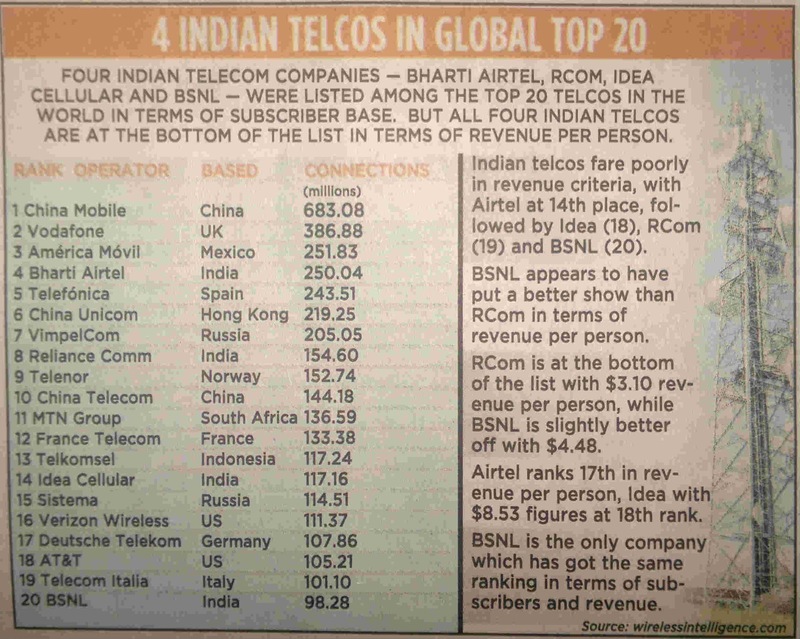 Four Indian telecom companies were listed among the top 20 global companies based on the subscriber base but all four are at bottom for revenue based. 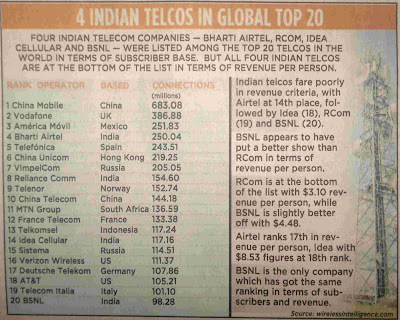 Bharti Airtel was ranked 4th and Rcom 8th and Idea cellular 14th and last but not the least BSNL at 20th position. Telecom major Bharti Airtel is the fourth largest mobile operator in the world with over 250 million connnections globally, according to analyst firm Wireless Intelligence. China Mobile continues to be at the top spot with 683.08 million connections, followed by Vodafone Group (386.88 million) and America Movil Group (251.83 million). Besides China Unicom (which is at the sixth position), the report said Bharti Airtel is the only other member of the top ten to move up the ranking, recording a 13 per cent year-on-year rise in connections to overtake Telefonica. Bharti Airtel had become the fifth largest mobile operator in the world following its acquisition of Zain Group's mobile operations across 15 African nations in June 2010, the operator said in a statement. It, however, added that Bharti's mobile revenue at USD 3.04 billion in the second quarter of FY12 is significantly lower than the other operators in the top five, "reflecting Bharti's presence in the ultra low-cost, low-margin Indian and African markets." The other Indian telecom operators in the report are Reliance Communications, Idea Cellular and BSNL at eigth, fourteenth and twentieth position, respectively, with 154.60mn,117.16mn and 98.28mn subscriber respectively. While Reliance Communications has maintained its global ranking, Idea Cellular has moved up three places. State-run BSNL's ranking dropped by two places. Telenor and Sistema foreign firms with a subsidiary in India were at the ninth and fifteenth position, respectively. Videocon offers one of the best postpaid prepaid service in Gujrat.